In my last post I put together a list of 41 companies which either have a DNA sequencing platform on the market, or in development. There is really only one company that dominates this market (Illumina) so most of the players are either niche plays or startups. Armonica is one such early stage startup. They appear to have raised 1.5MUSD . 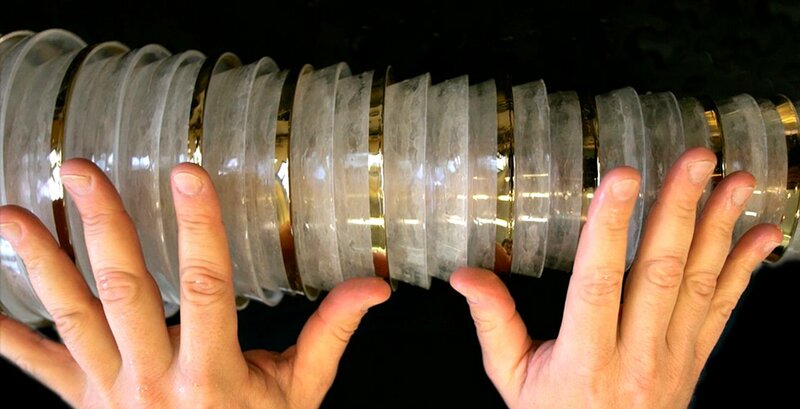 Before looking into the technology, there are a number of things that stand out about Armonica. Firstly it’s an LLC, typically the received wisdom for creating a venture funded tech startup is to create a Delaware C-Corp. From what I can tell, creating an LLC could be problematic for traditional investors (who might want preferred shares for example)  (appears to now be listed as Armonica Technologies Inc. ). The next thing that stands out is the list of “Board Of Directors/Executive Leadership”. There are 5 people on this list , but of them only Steven Brueck (CSO) and Scott Goldman (CEO) appear to be part of the company (the rest are investors). Sally Corning is listed as co-founder, and a partner at a fund, which seemed odd to me. A LinkedIn search shows Scott and one other senior consultant. The CSO is a university professor so most likely doesn’t do much at the company day-to-day. An SBIR entry suggests they have 23 employees which seems surprisingly high . Overall, it seems to be seed stage, the company was founded in 2015 . Armonica is an optical nanopore DNA sequencing company. Optical nanopore approaches use a nanopore to control the motion of a strand of DNA but an optical readout (as opposed to direct electrical detection ). Armonica are not the only company to propose the use of an optical nanopore, Quantapore have presented a protein nanopore, FRET based concept too. But the method suggested in Dr Brueck’s patents  and paper  differs significantly. Firstly, the fabrication methodology they’re suggesting is quite novel, and secondly the optical readout is label-free (using surface plasmonic resonance). First up, fabrication. There are a number of novel features here firstly they’re using interference lithography to define their features. Interference lithography is one technique that lets you beat the diffraction limit and create features smaller than the wavelength of light. It does this by using the interference between two coherent light sources to define the pattern. Pretty neat! 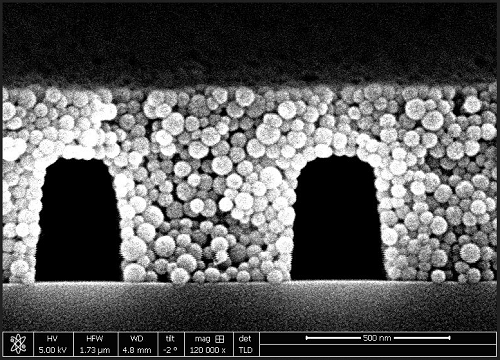 The downside is of course that you are limited to periodic structures, but that seems fine for nanochannels and they present SEM images with channels as small as 100nm. After using interference lithography to lay down photoresist they then lay down Silica nanobeads, after which they heat the whole thing, baking out the photoresist and sintering the silica to create the final structure. Neat! The exact advantage of using nanobeads over other deposition methods is less clear to me (I’m no expert) and some quick googling brings up some alternative methods for creating enclosed nanochannels . It would be interesting to dig further into this aspect of the technology, and contrast the various approaches here. With nanochannels in place, they can DNA through them (see below) . This is where their paper finishes up. The Silica is transparent, so they can image YOYO stained double stranded DNA right through it. They note that in the small (100nm) channels, it’s harder to get the DNA moving through, and that it moves more slowly (driven only by capillary action here). 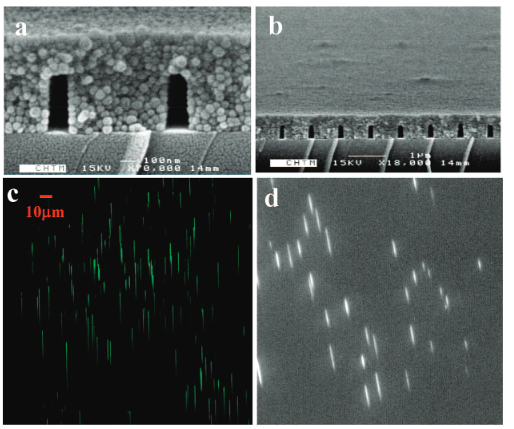 DNA imaged in nanochannels from . The above is based on published work out of Brueck’s lab. 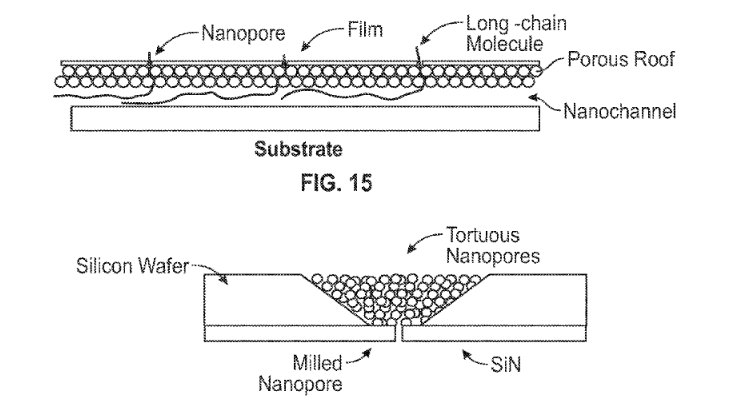 The patents (and brief description on the website) mix things up a bit, and describe a tortuous nanopore. In the patent tortuous nanopores are rather aptly described as “complex, 3D paths, similar to the spacings and open paths created when oranges are piled up in the local supermarket”. So, the idea is rather than precisely defining a nanopore, you can stochastically define them with these piles of silica nanobeads. You can also use a more traditional deposition method to (somewhat selectively) close apertures in this “tortuous nanopore”. This also seems like a rather neat idea. The tortuous nanopore concept potentially provides a method for slowing translocation (generally an issue with solid state nanopore systems) and for generating small apertures than available with traditional fabrication processes. It makes me wonder if the system couldn’t be used for ionic current detection (or perhaps there is too much stray ionic current, or other issues). From what I can tell the system uses a bias voltage to drive the strand through the pore. The base detection process is probably the least detailed part of the patent. My understanding is it essentially states that they’ll use surface plasmon resonance, and that there are a bunch of ways of doing that. Using SPR for DNA sequencing isn’t a new idea, and a quick google brings up grants for as early as 1999 . But I would have to do more reading to know how practical it is here. Interestingly another company (Redondo Optics ) has an SBIR grant  for using SECAR SPR for DNA sequencing. The CEO of Redondo optics is also on the Armonica SAB. With more time this would be an interesting avenue to follow up. For the moment however, I leave this brief review here. Overall the Armonica technology seems to have a number of interesting novel aspects. If you have any further insights into the technology, or would help to chat about DNA sequencing drop me a line (new at sgenomics dot org), or leave a comment! Most other nanopore companies propose detection through the blockage of ionic currents, or tunneling currents.